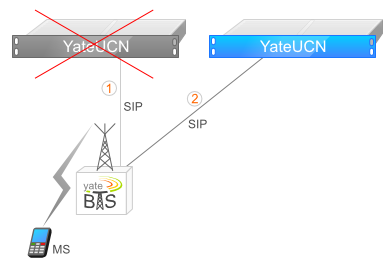 YateBTS 4 introduces redundancy support for YateUCN. This is a revolutionary feature that deserves some explanation. Redundancy failover and load balancing. A YateBTS network is a many-to-many mapping between YateBTS base stations and YateUCN core network servers. Core network loads are distributed evenly and are redistributed automatically if a server fails. The resulting network is resilient and easy to manage. To add more capacity, just add more servers. If a server fails, its users are shifted to other units within a few seconds. This is a sharp contrast to the conventional mobile network, a hand-configured, tree-like hierarchy, with points of failure that become more concentrated as you move toward the HLR. Release 4 also introduces handover support, which is revolutionary in its own way because it is done very differently from conventional GSM. Because YateBTS has no BSCs, handover is a peer-to-peer operation. The result is a 2.5G radio network that behaves much more like LTE, which is one of the innovations that make the Unified Core Network possible. YateBTS Release 4 has been available since July, but got little fanfare at the time. That won’t be the case with Release 5, which will be ready soon, so watch this space.